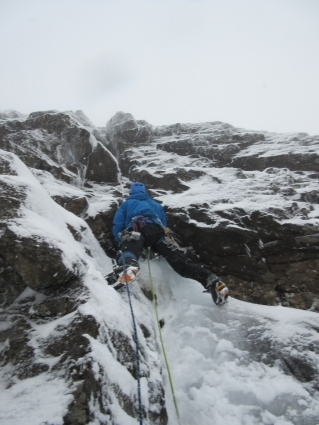 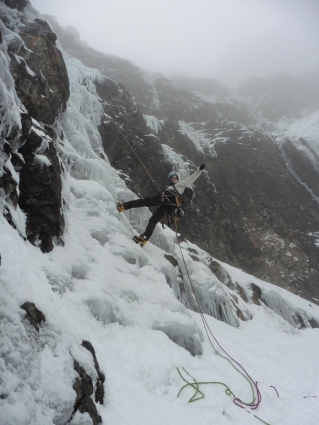 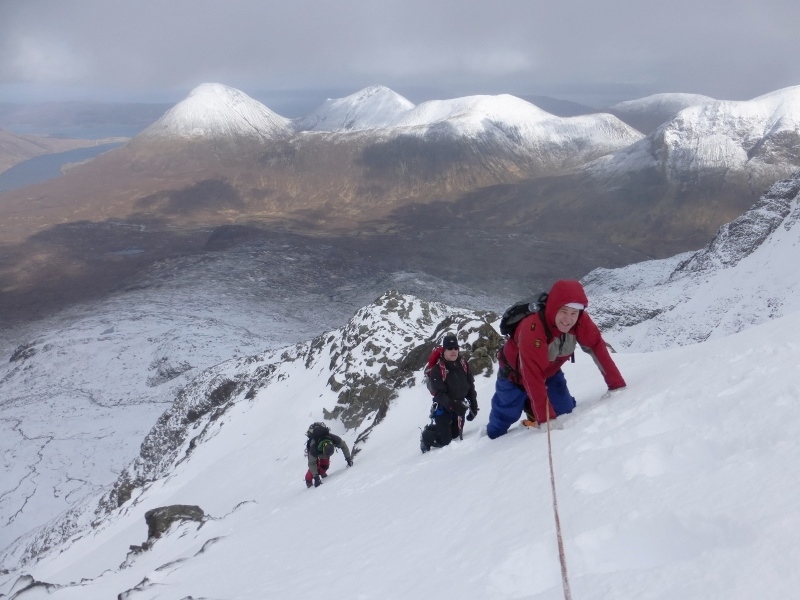 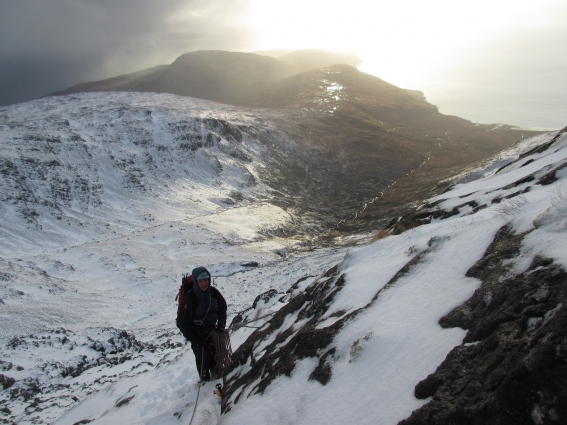 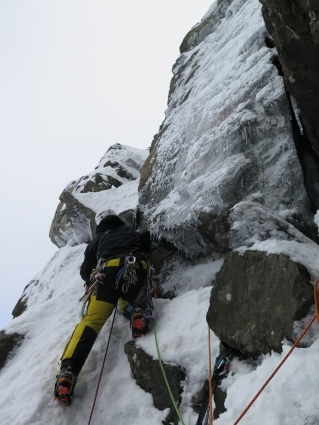 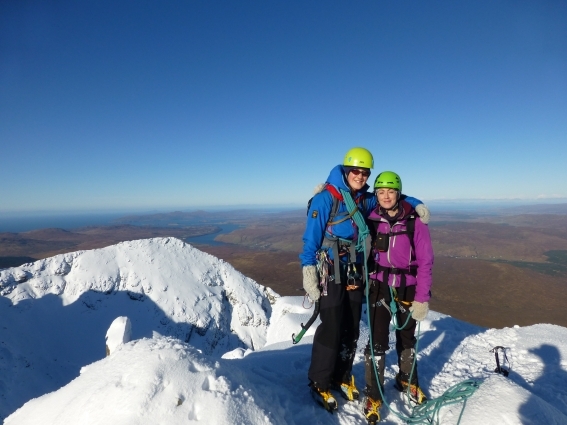 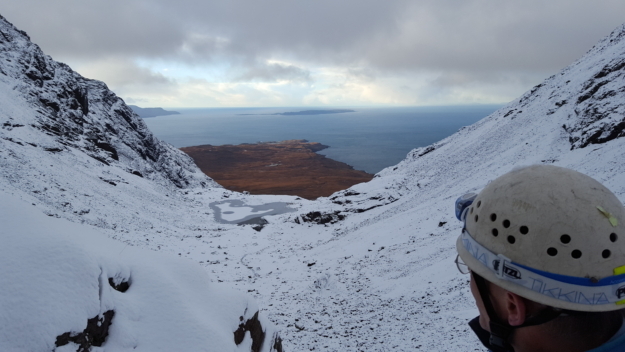 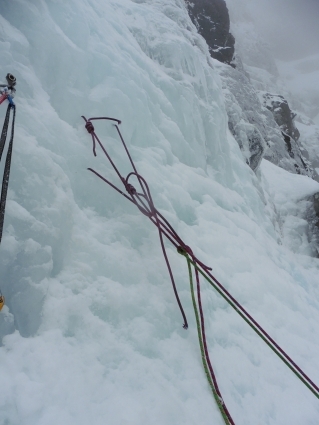 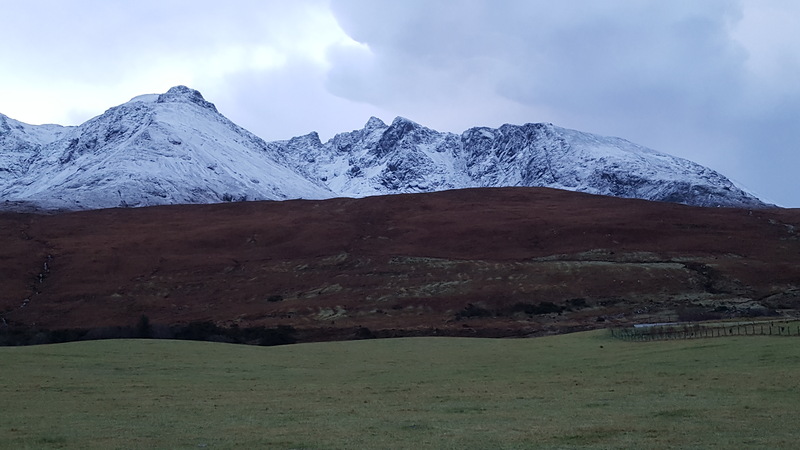 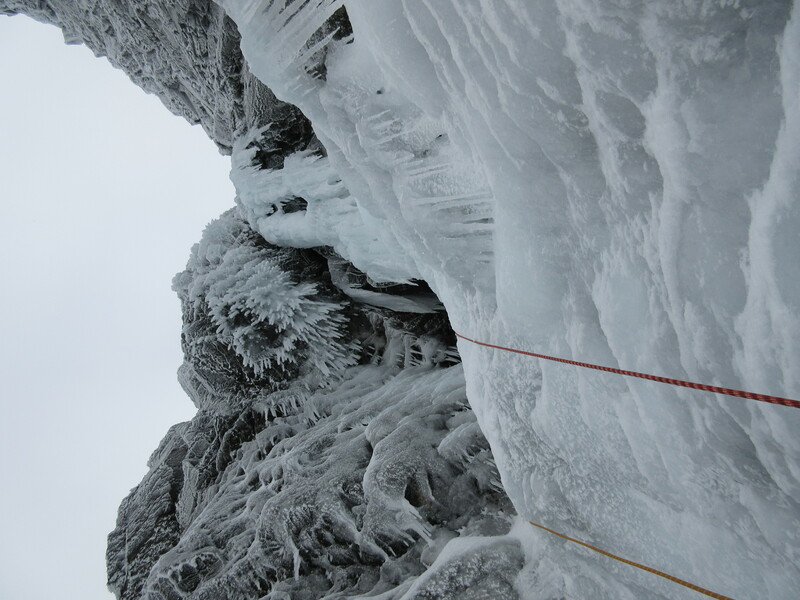 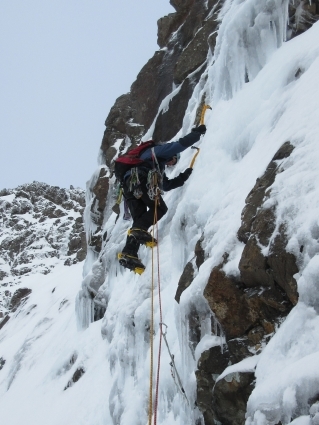 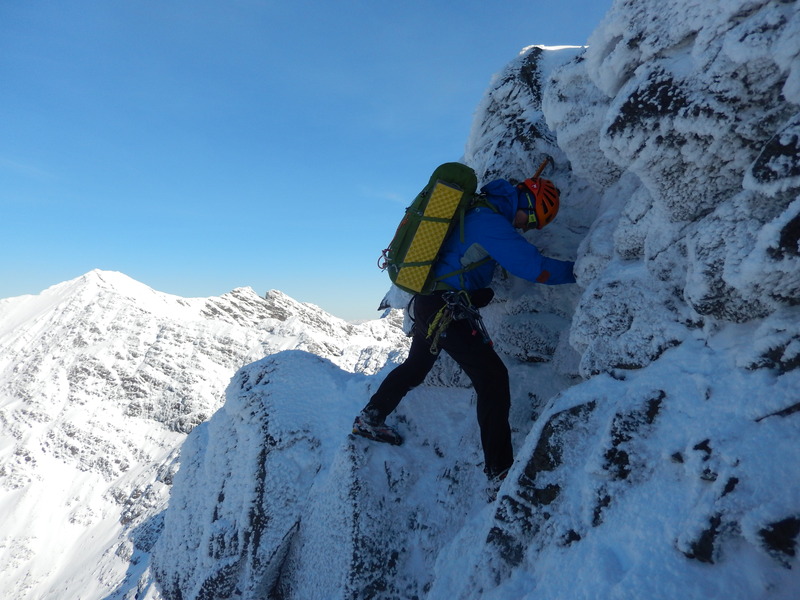 The first week of the Skye Winter Climbing Festival was very productive with keeness, weather and conditions allowing great climbing every day. 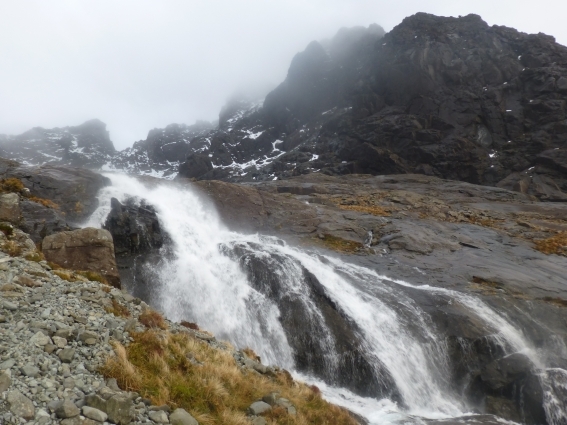 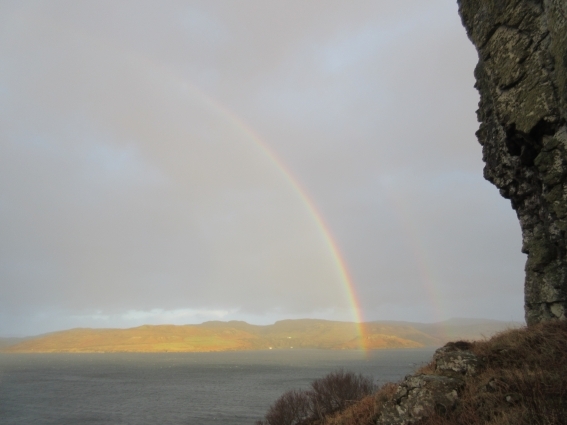 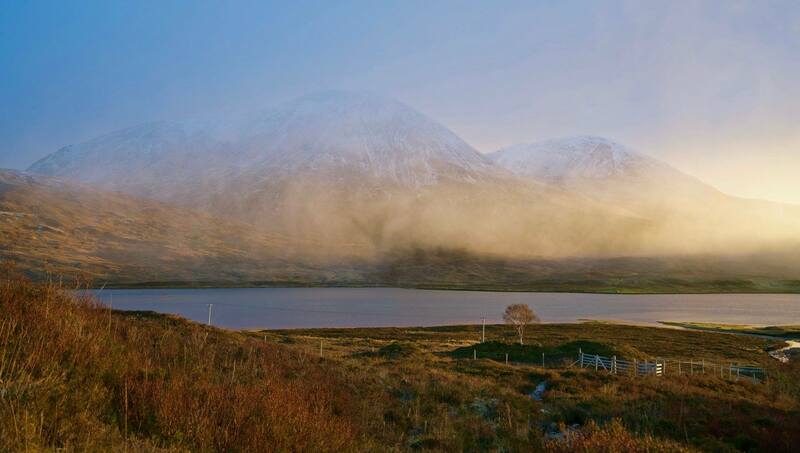 The weather for the second week wasn’t the best but Skye still produced its magic for everyone who ventured out. 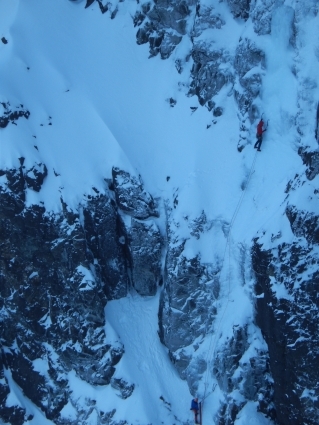 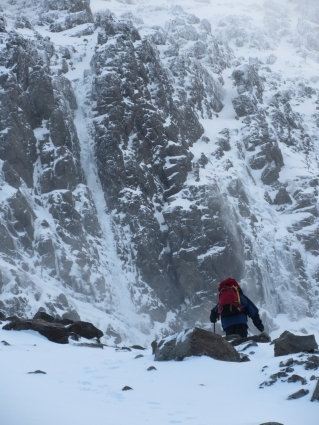 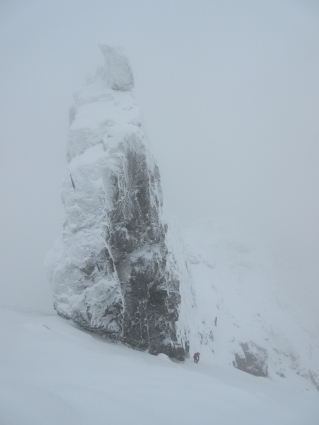 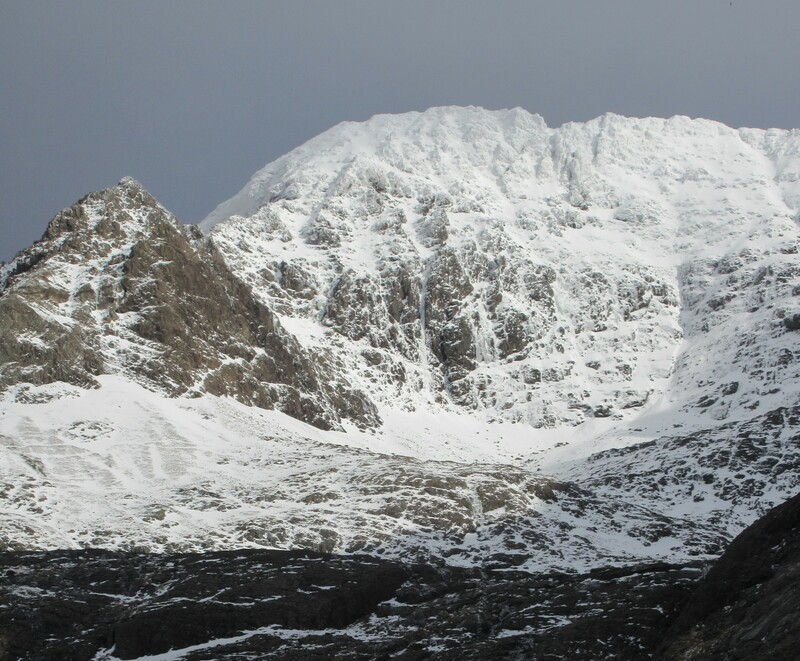 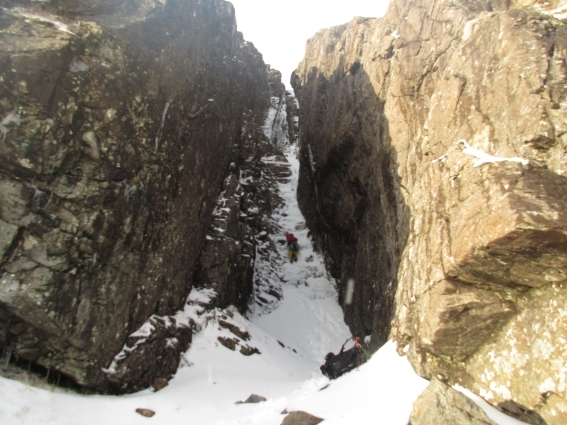 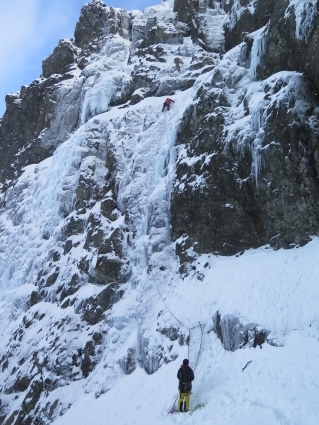 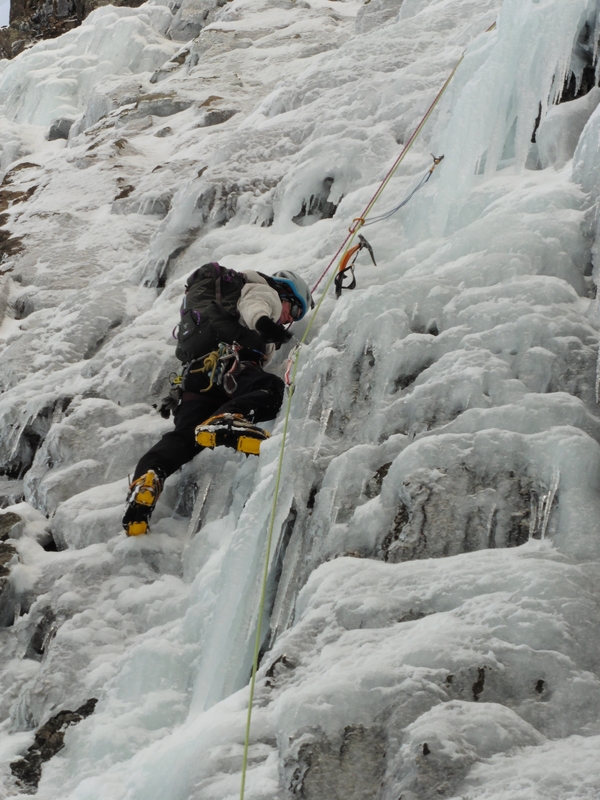 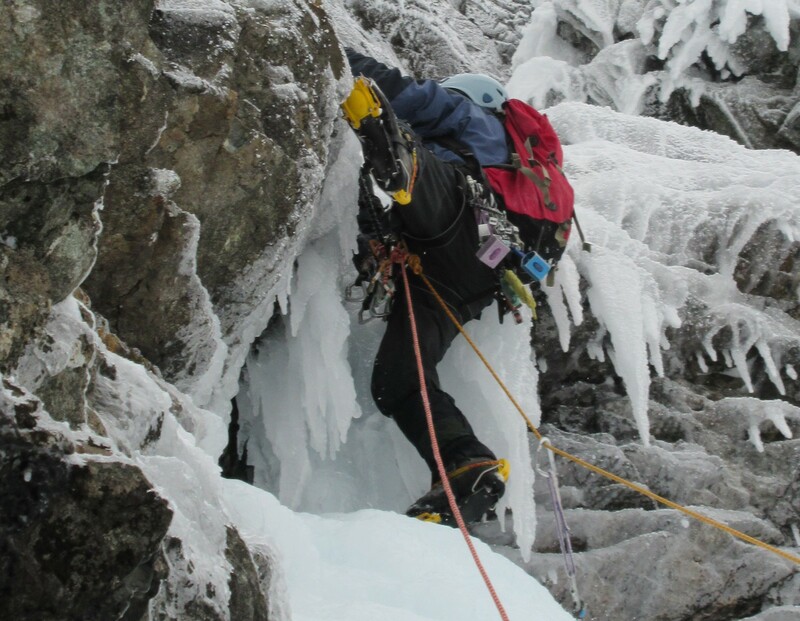 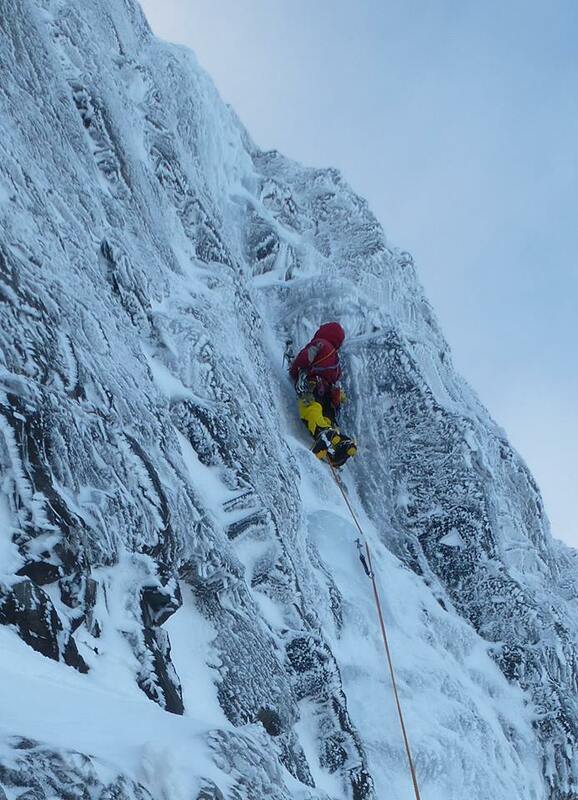 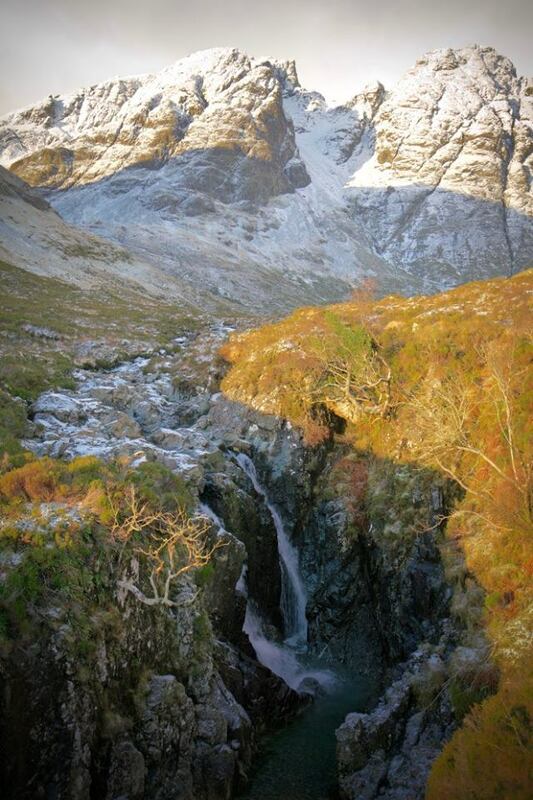 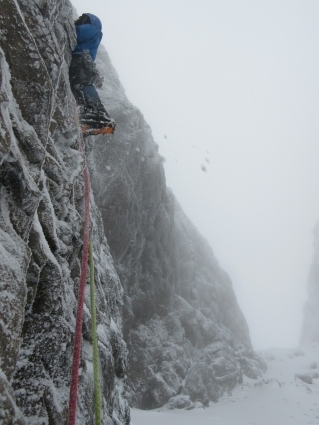 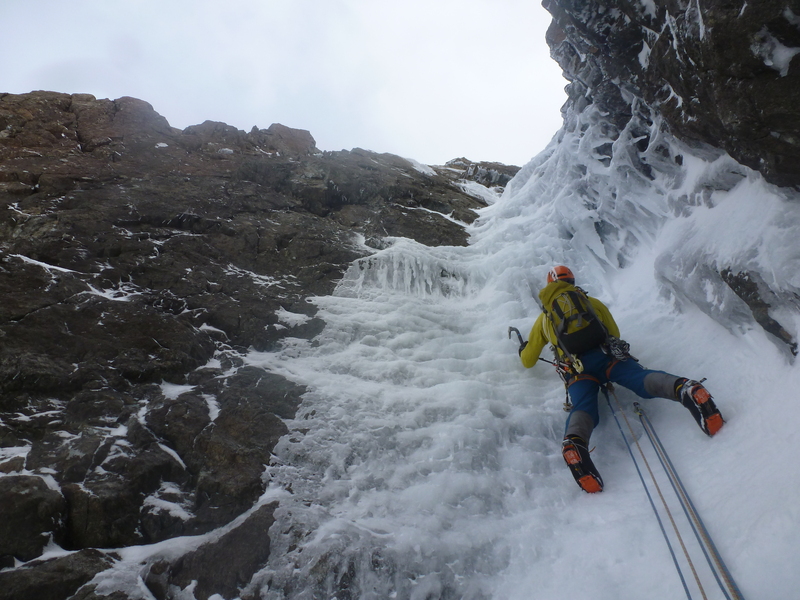 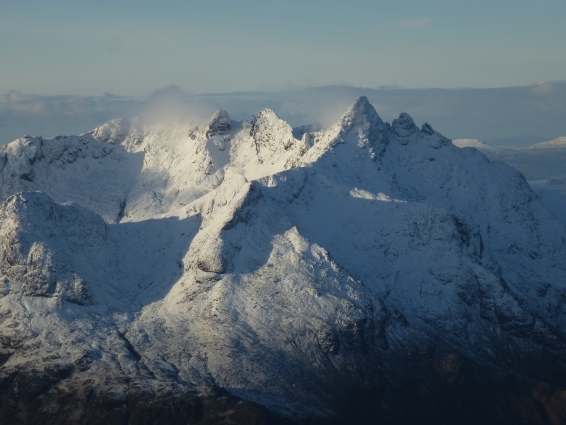 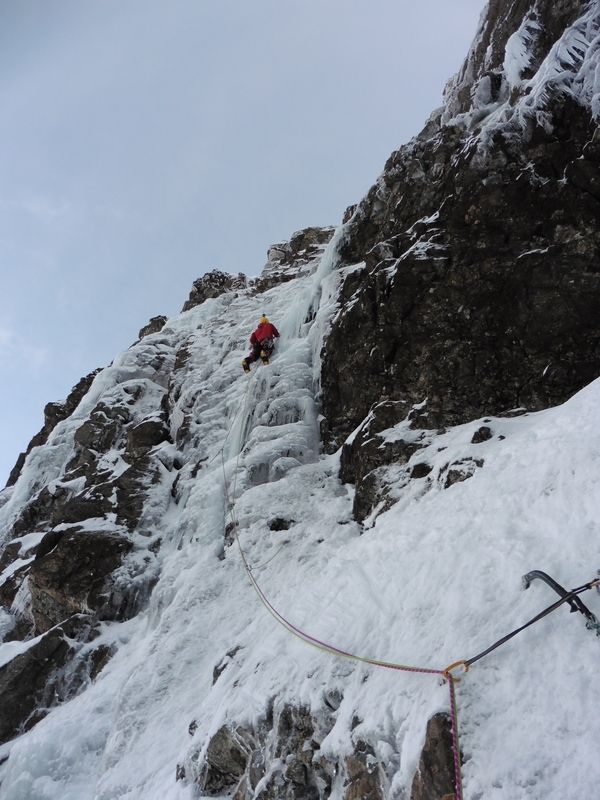 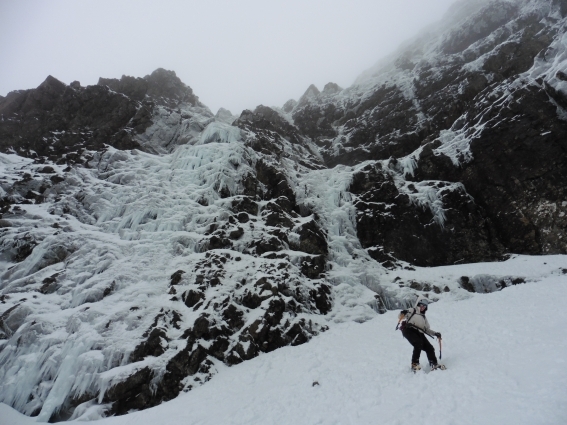 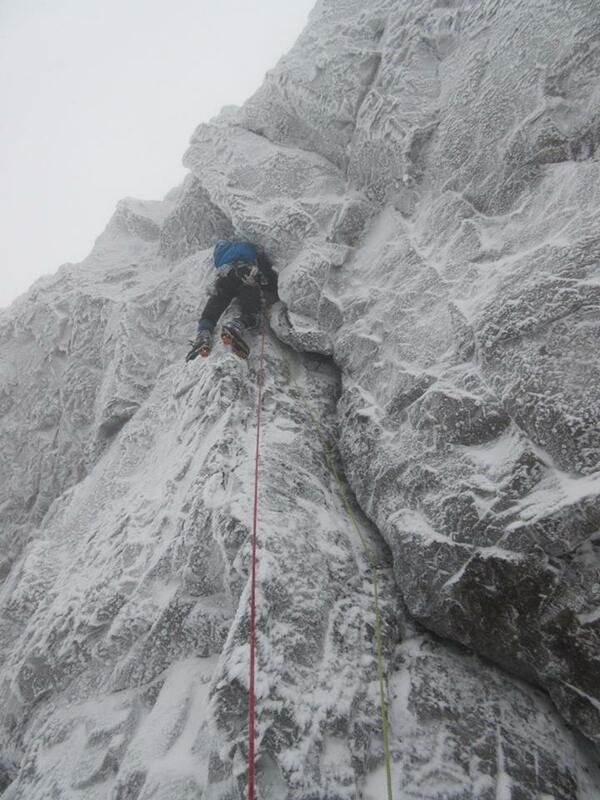 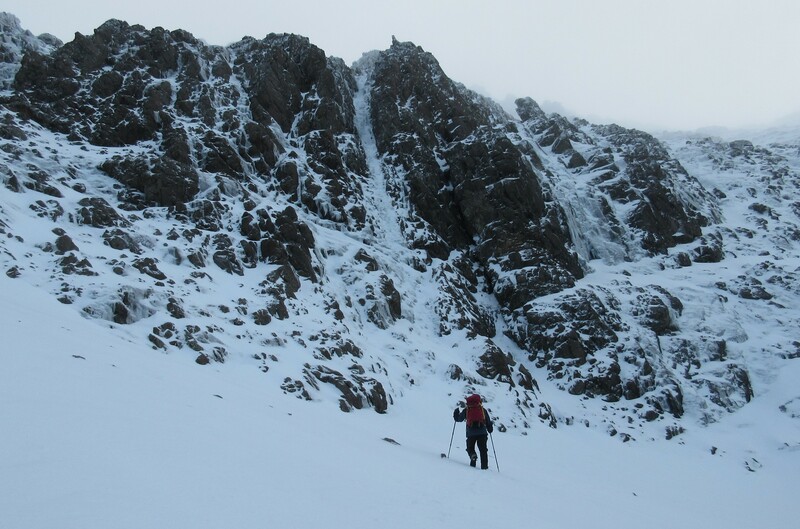 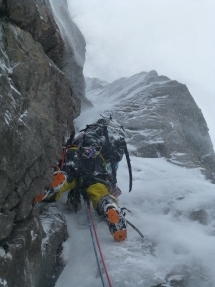 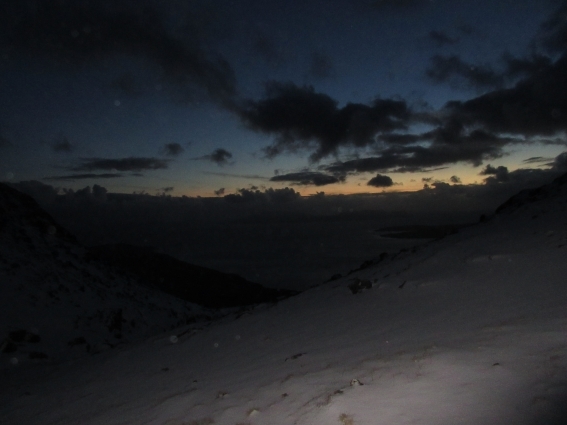 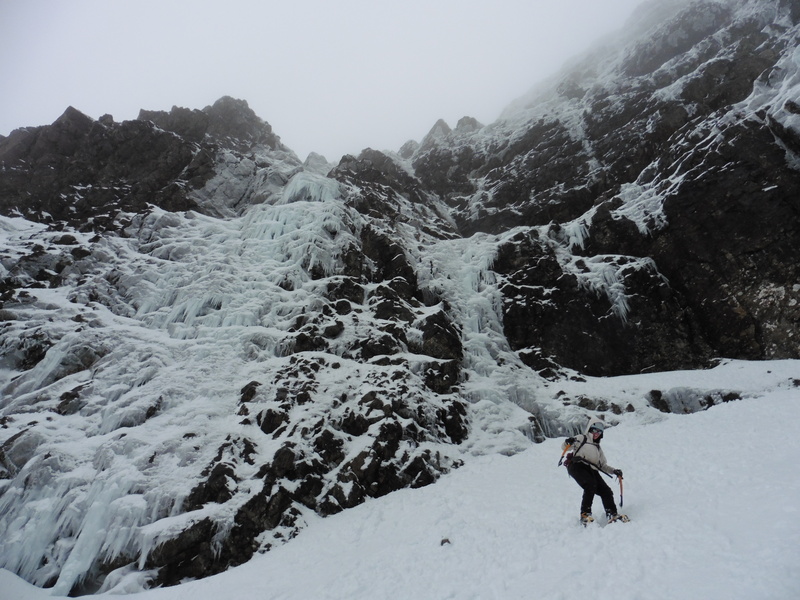 The meet started with a huge bang from Skye boys James & Doug Sutton making the first winter ascent of Crack of Dawn. 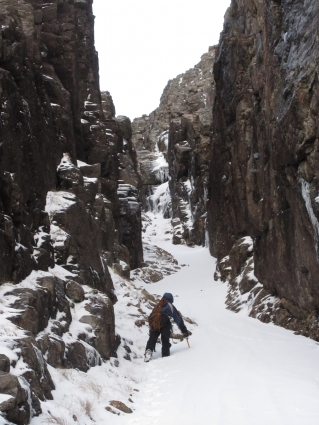 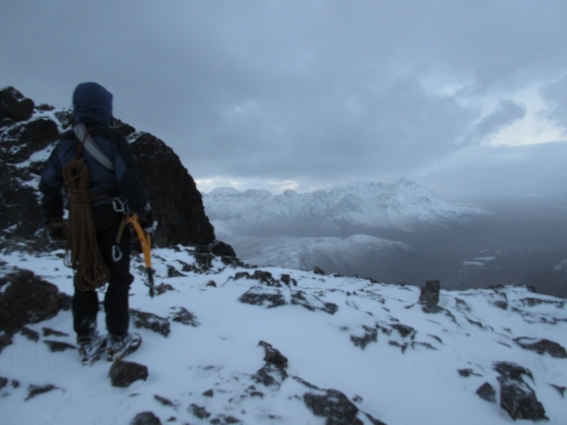 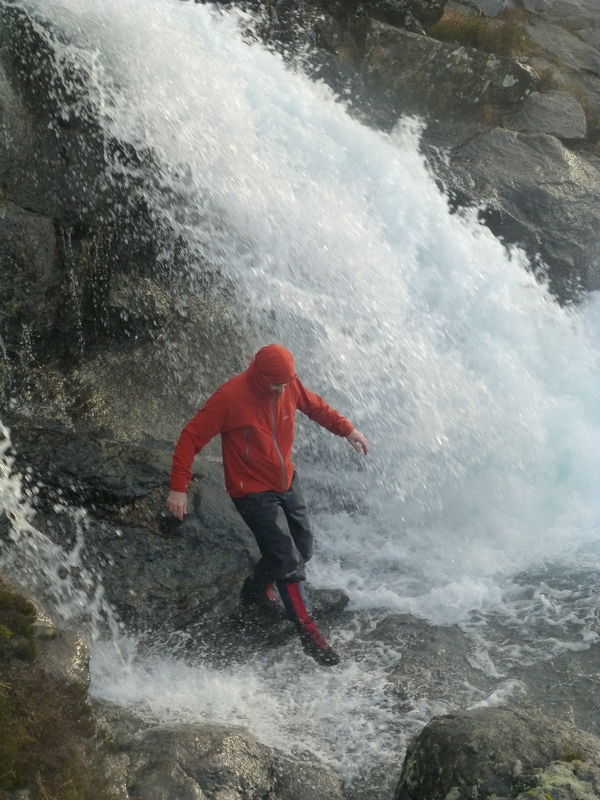 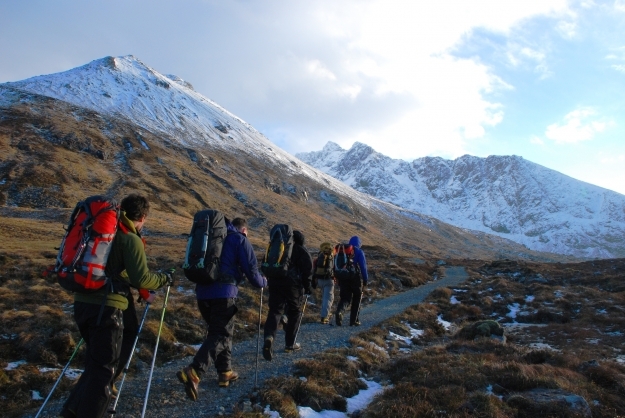 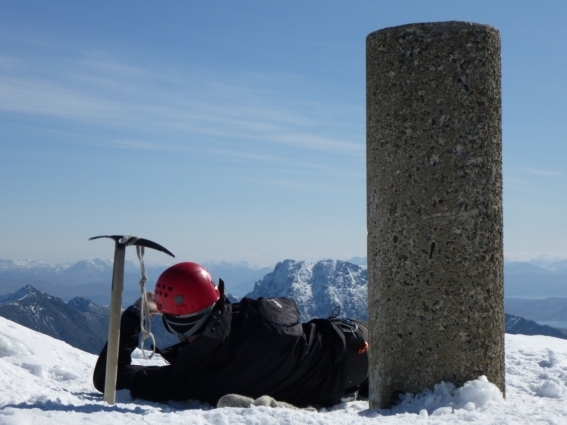 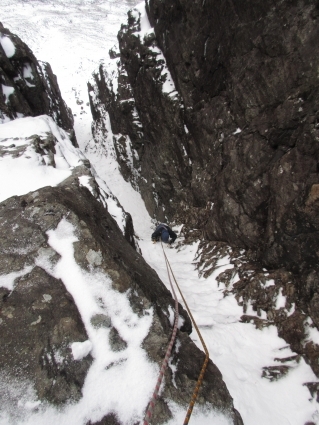 Grade VIII is as hard and serious as any route on the island and well untruly keeps the Cuillin on the hard man’s radar. 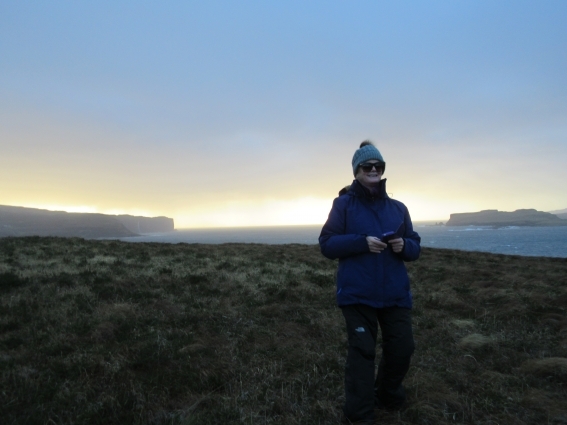 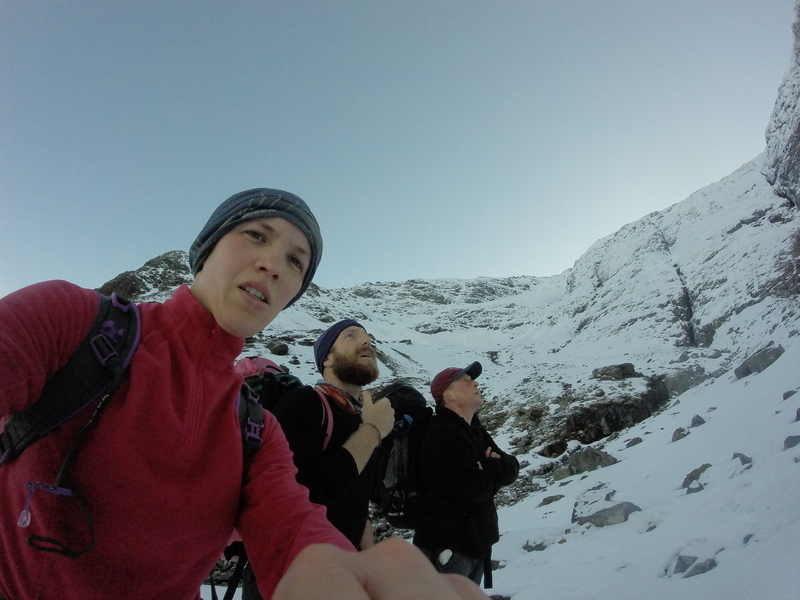 Weipeng, Maymay & I had a more gentile day taking in a feast of light & colour on an ascent of Bla Bheinn. 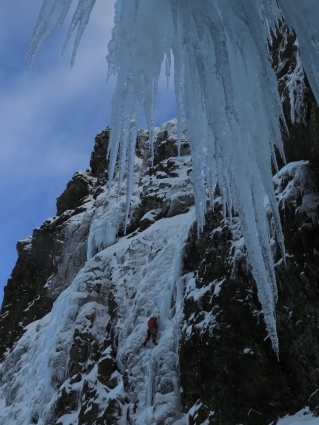 Their Sony camera produced some of the best quality shots of the week. 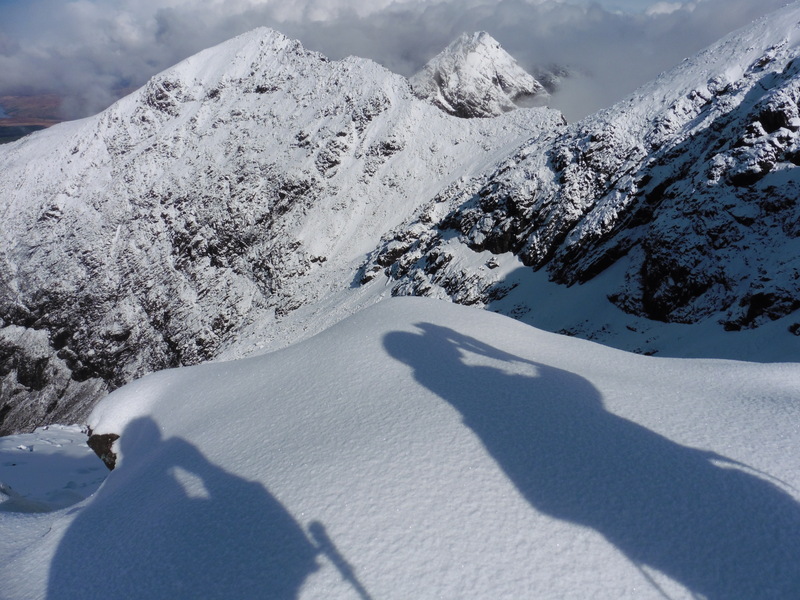 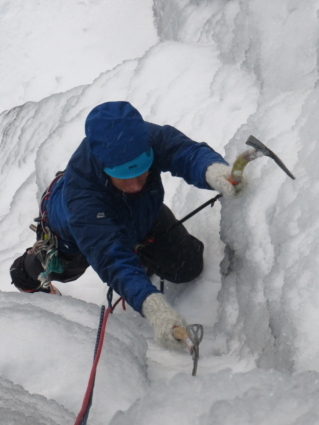 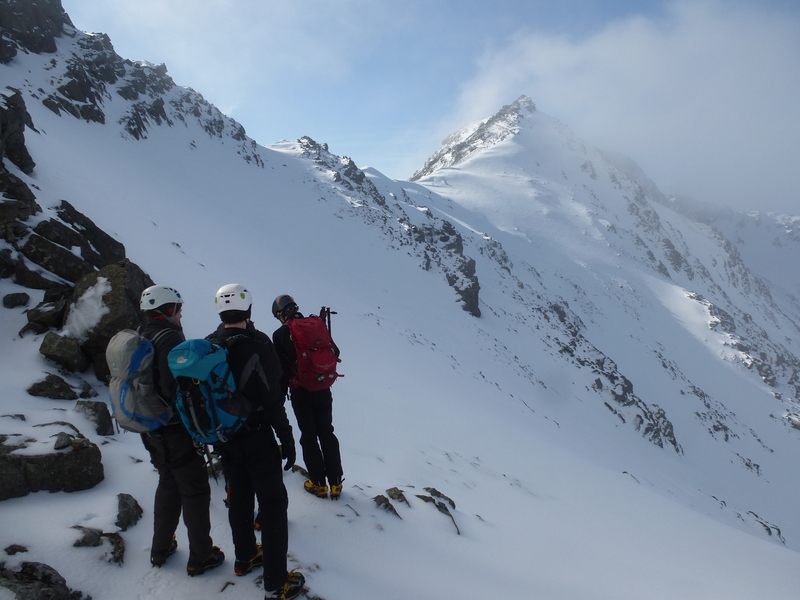 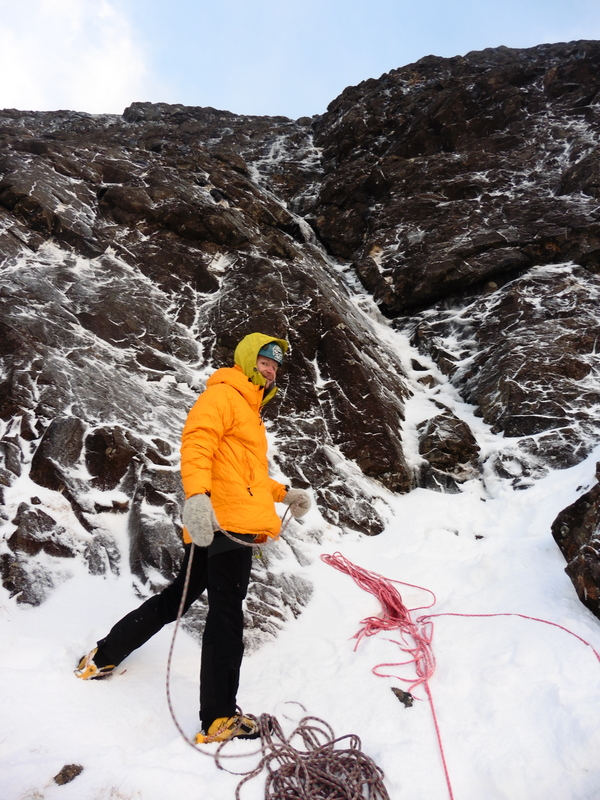 On Friday Pat Ingram and I looked at a new crag low in the Cuillin to avoid the deep powder higher up. 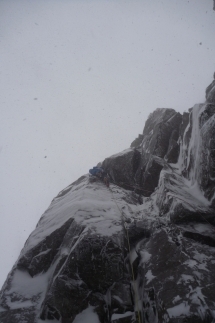 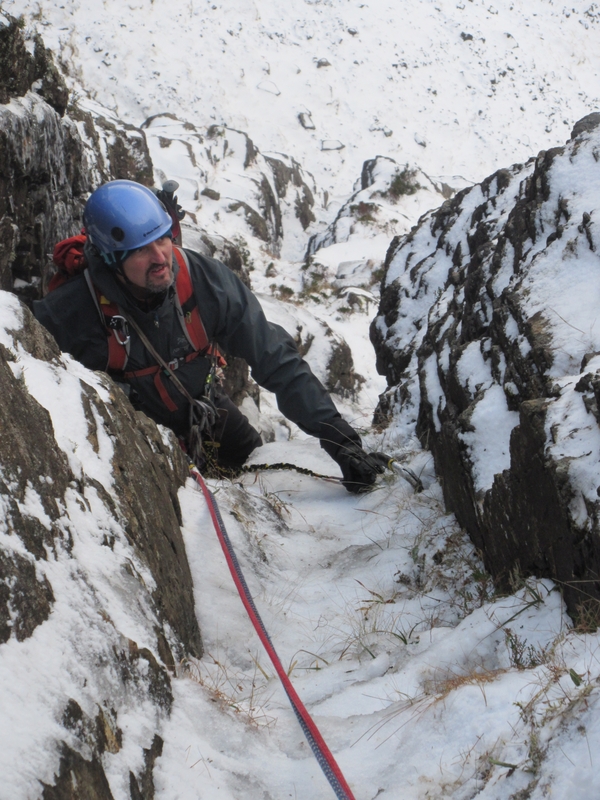 Park Lane V,4 wasn’t as frozen as hoped for but gave good some very good climbing. 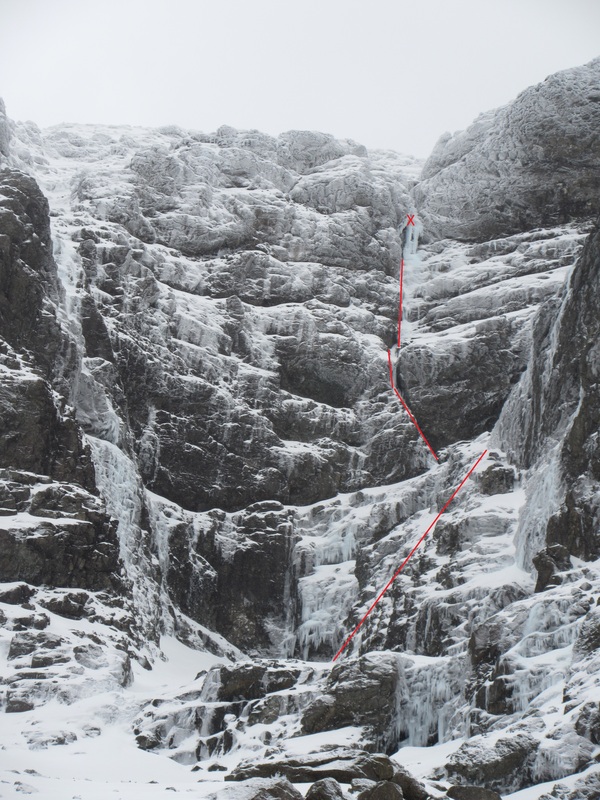 Beads & Dave Bowdler got a beaut of a route following North Rib of Banachdaich Gully at grade IV,5 with steep well protected climbing. 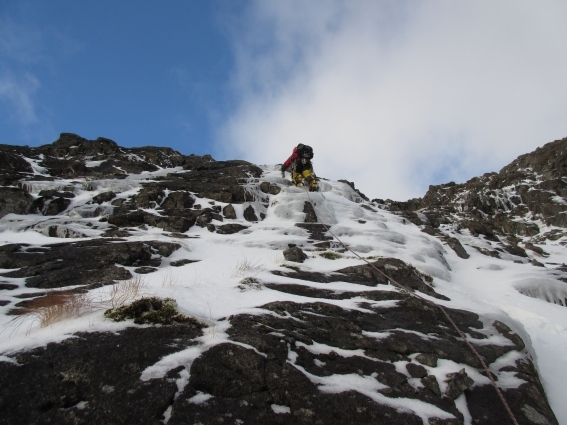 Saturday the good forecast was slightly out but just added more snow & ice to the fun. 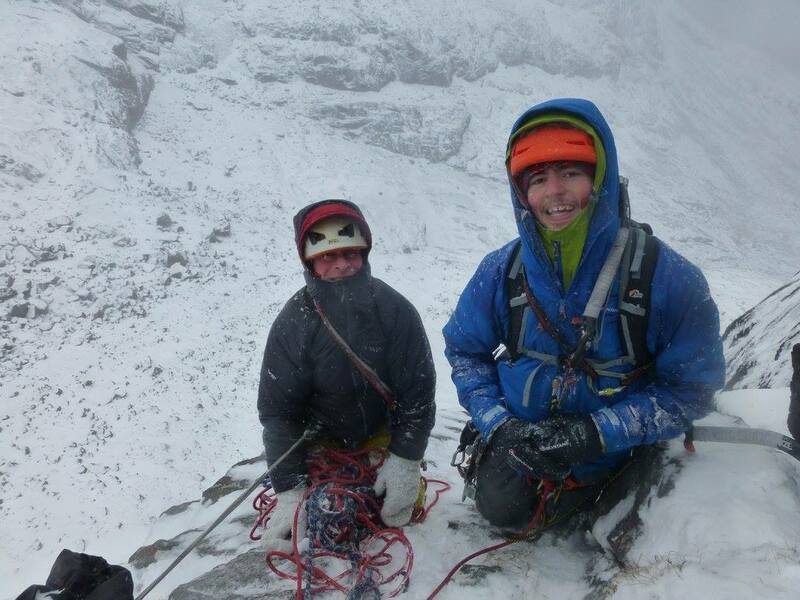 Lucy & Nathan must have had 1.5 hours on the belay waiting for me to top out on Owl Chimney IV,5; thanks guys. The route was technical right to the top but well protected. 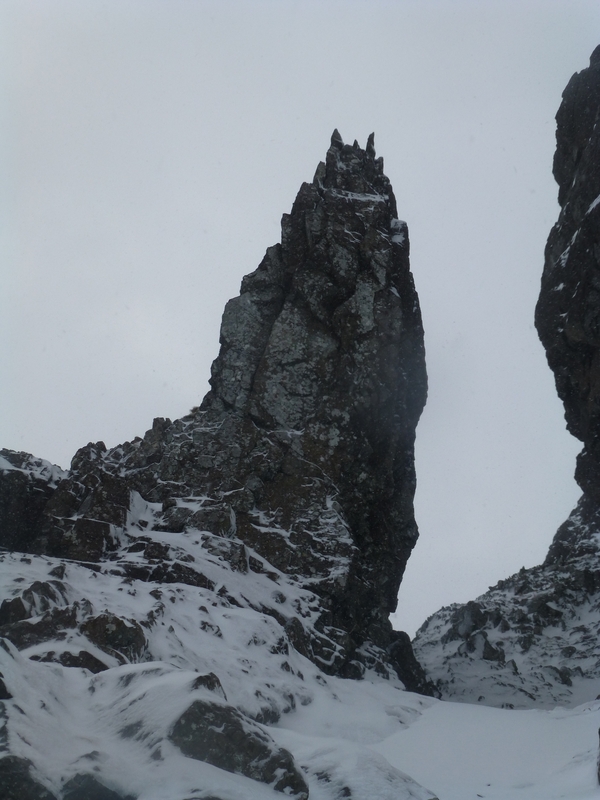 A bonus for all of us was seeing the Owl Pinnacle which is as elusive as the real bird from almost all angles in the corrie. 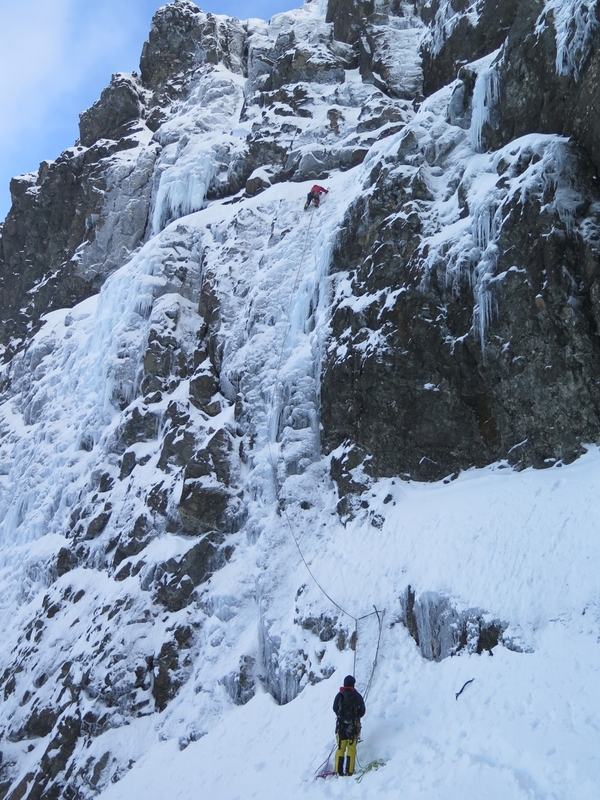 Beads & Dave added a direct start to South Buttress just to our right at IV,4. 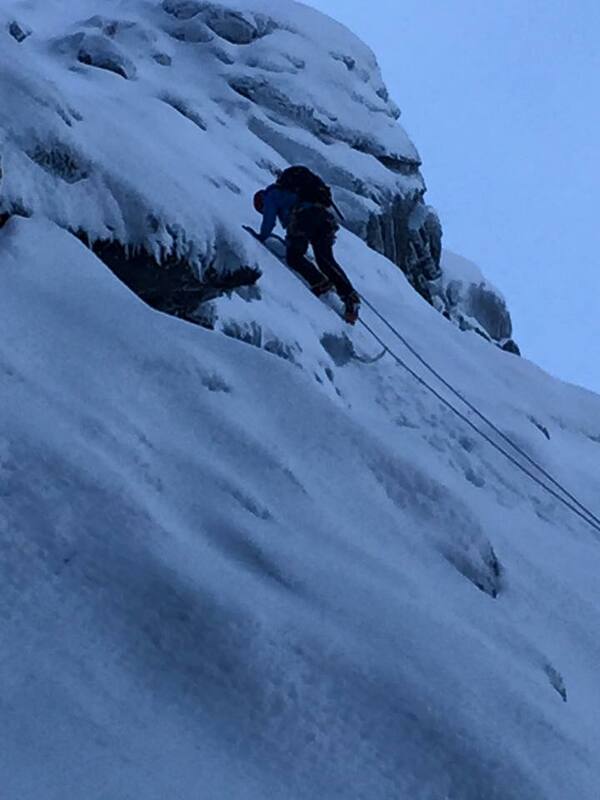 Meanwhile Michael Barnard & Pat were climbing Tres Difficile V,6 a steep line immediately left of the TD Gap summer route. 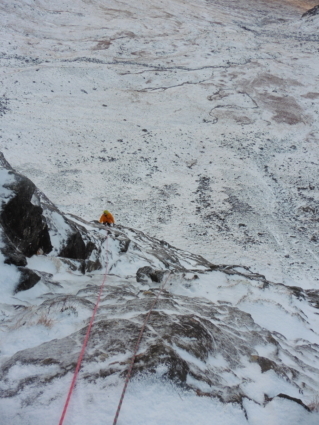 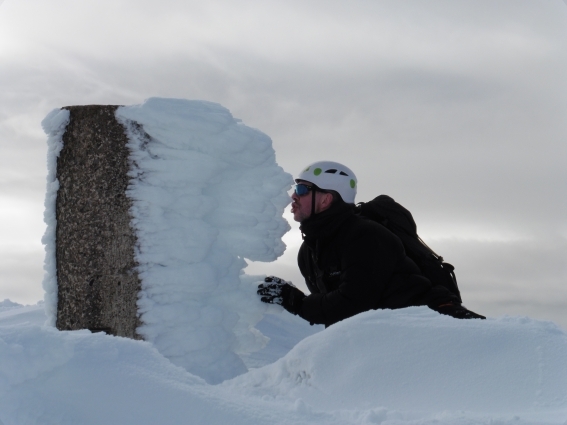 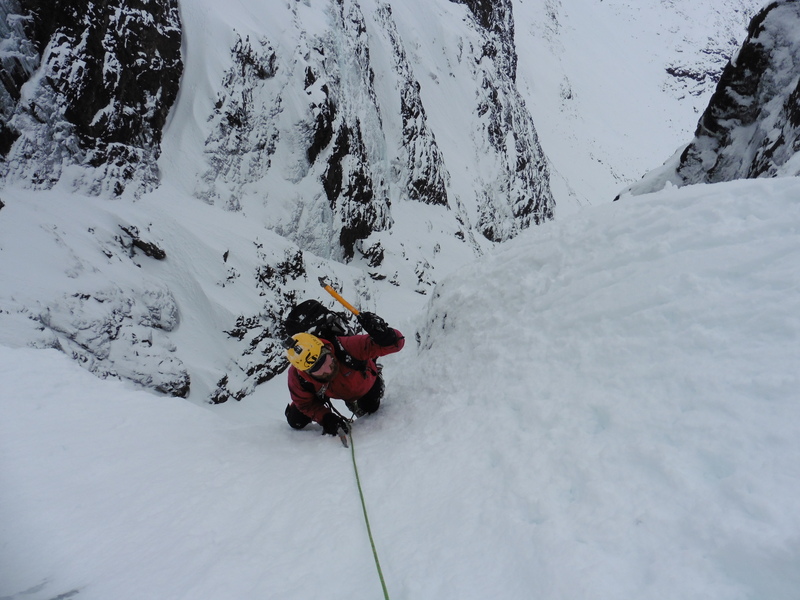 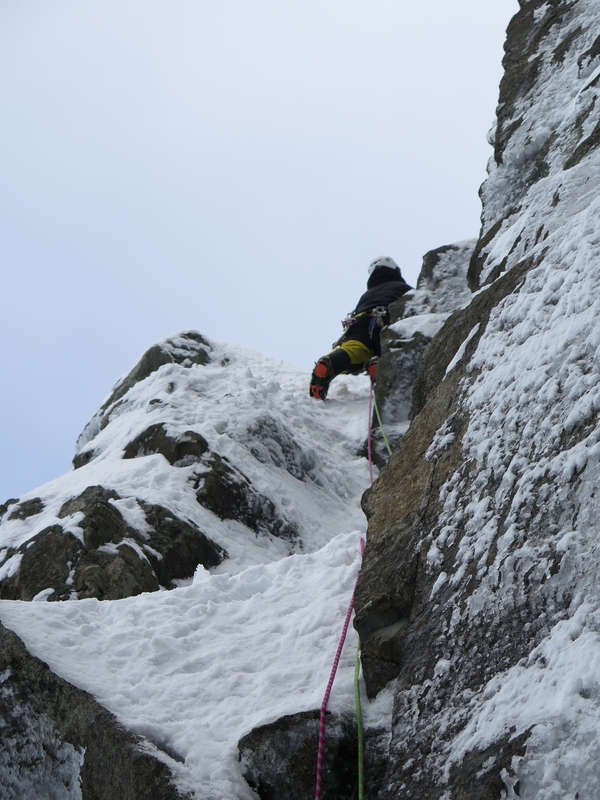 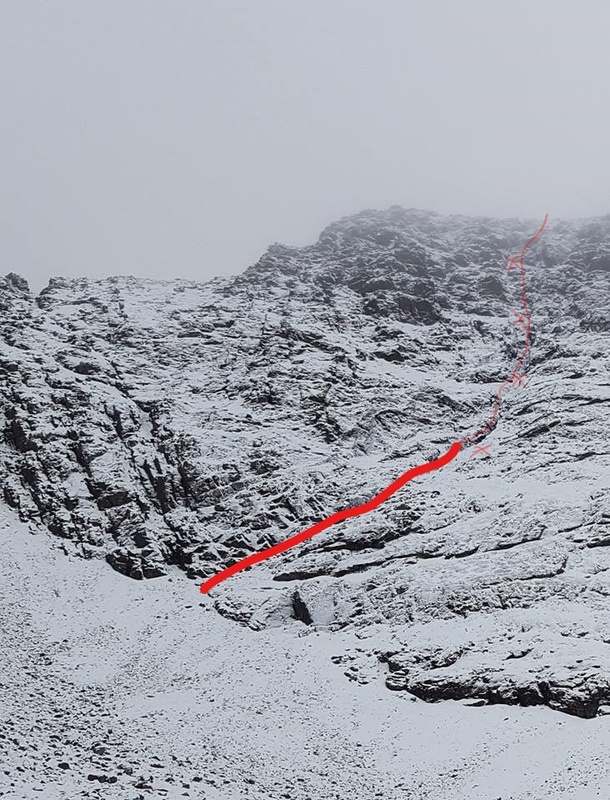 They then moved onto the south face of Alasdair and a line immediately right of Michael’s route from last year Skye High. They abseiled off after a pitch with Michael keen to come back and add anothe pitch to complete the route. 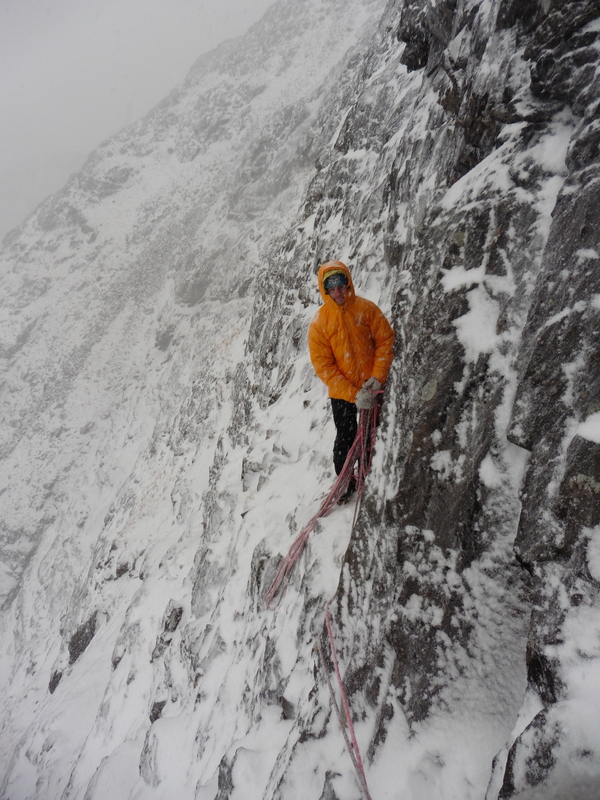 Michael high on Tres Difficile, V,6 TD Gap. 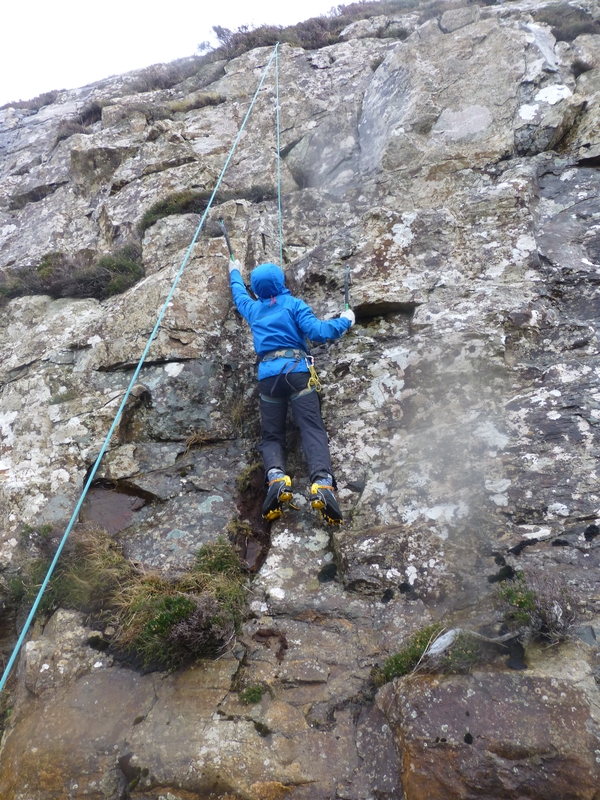 A 5am start on Sunday allowed Michael and me to get 2 new routes climbed on the Stone Shoot face of Thearlaich. Both were very technical and I was very glad to be following. 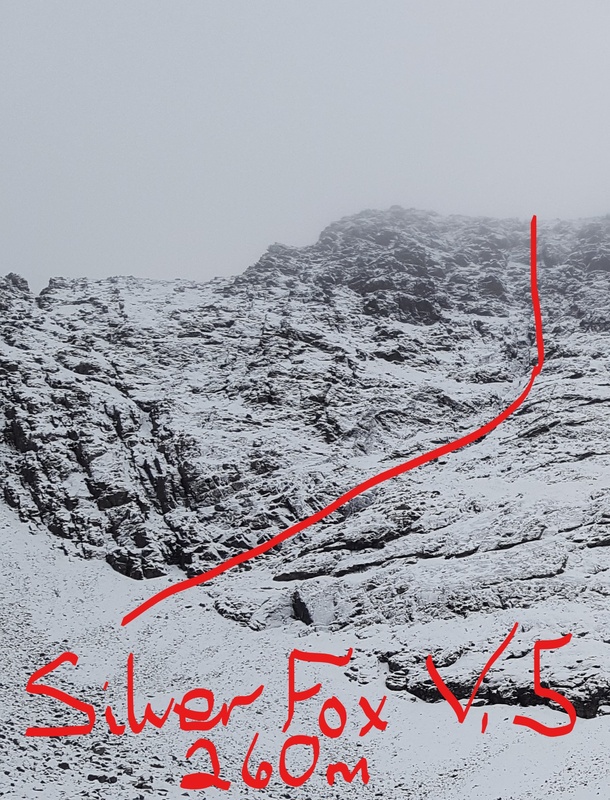 The Bogeyman, VI,7 was a serious and sustained route that looked as promising as the route next door (Curse of the Hobgoblin V,6) but was very sparse on gear and had more than it’s share of loose rock. Far more solid but desperately steep the line closest to the top of the Stone Shoot gave Mr Charlie VI,7 which I finished off by squeezing under the summit cairn itself. 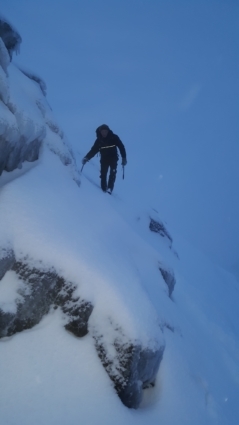 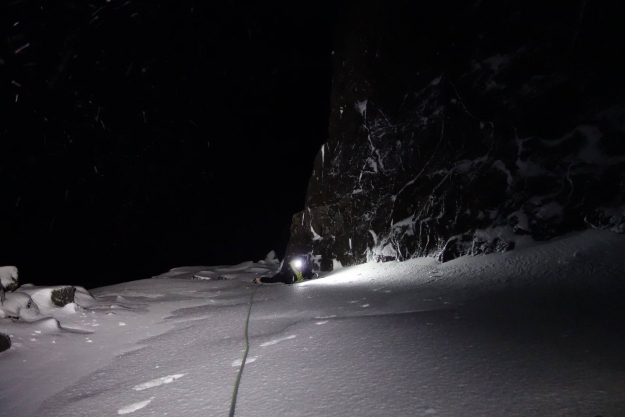 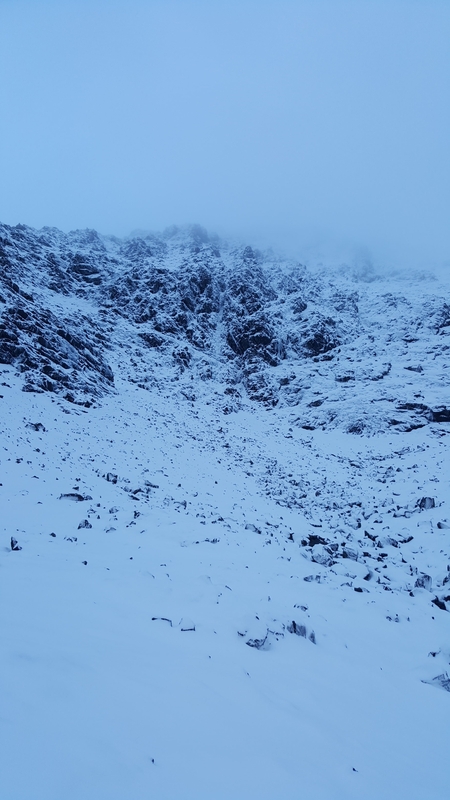 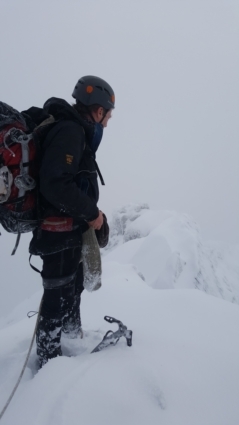 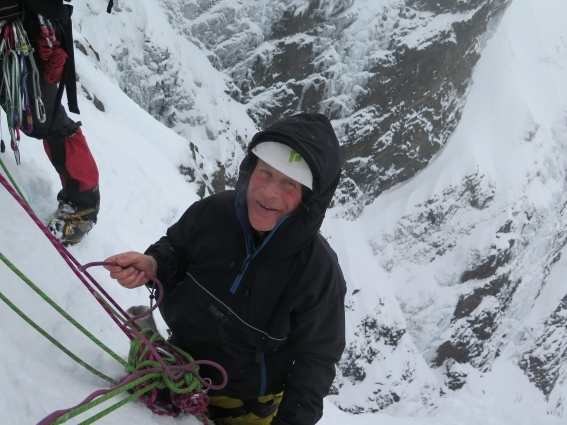 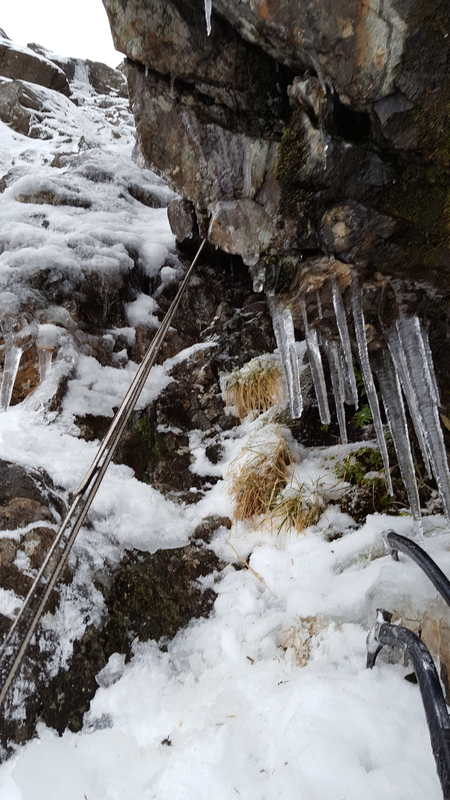 On Monday Michael, Julian Goddard and Mark Pratt had a long day climbing Fox’s Rake III,4 in not quite ideal conditions with more snow than ice but all good fun and a headtorch descent. Tuesday had me kicked out of bed at 5 again as Michael had a mission to finish his route on Alasdair. 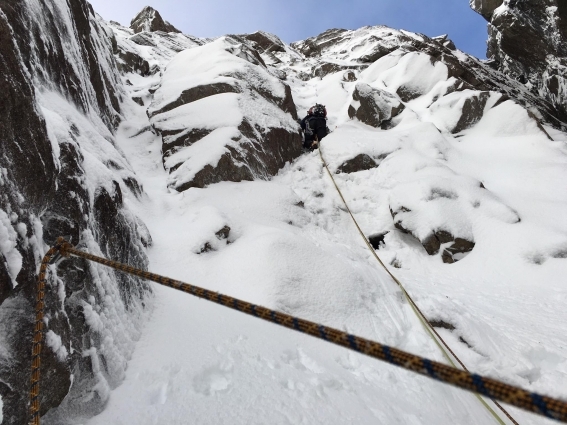 Pat had promised me that the first pitch was very good and he wasn’t lying; a beautiful line with positive hooks and good gear all the way. Temperatures were rising rapidly as Michael explored the options above before finally returning to the belay soaked through. I took the obvious easiest line of weakness up a tapering ramp above the steep initial wall. 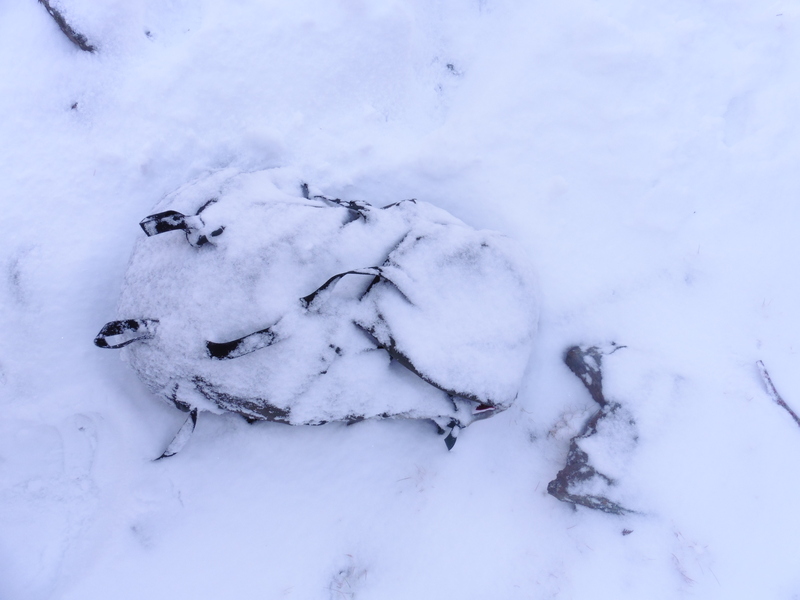 It looked blank and smooth to start with but a bit of courage was rewarded with a cluster of bomb-proof gear before running it out on a series of positive edges and small hooks. 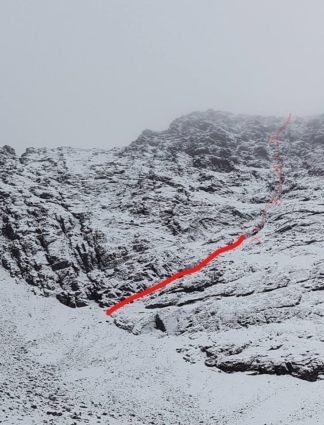 Michael’s sling was still there at the top of Skye High from last year and I was able to see the quality of that route as we abseiled straight down the line; inspiring stuff. 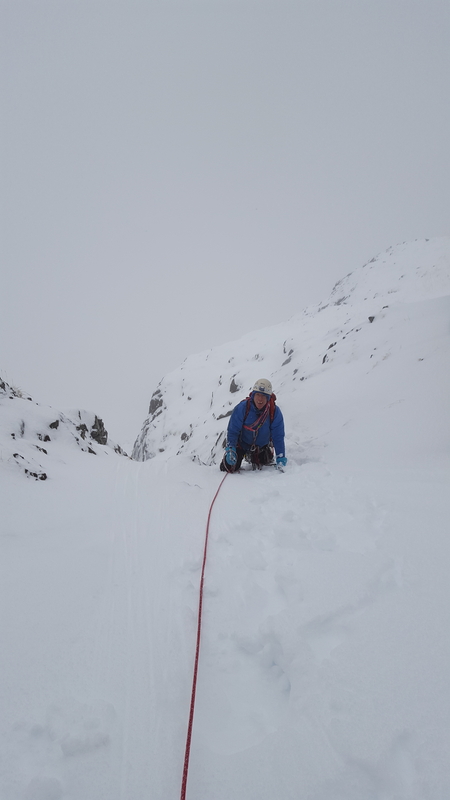 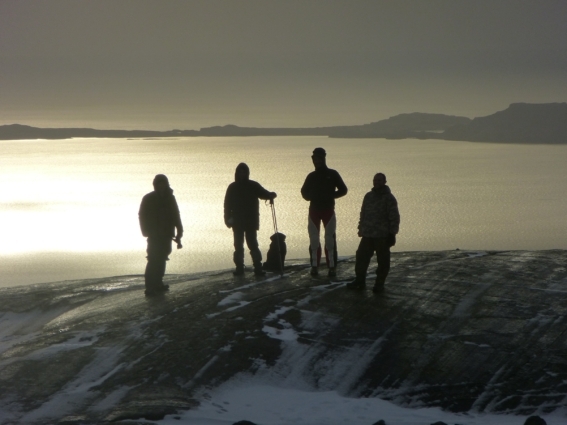 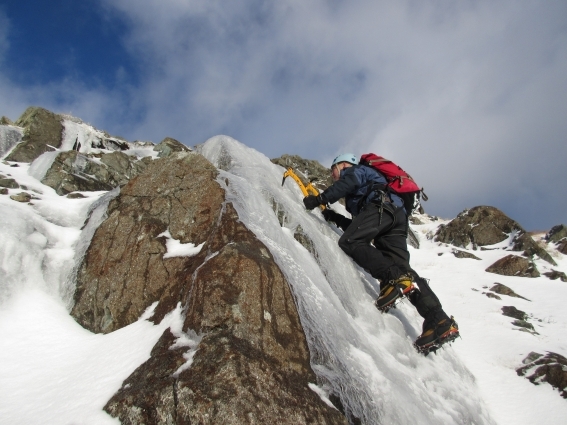 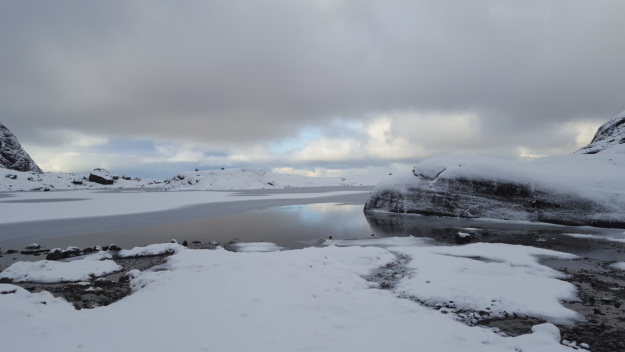 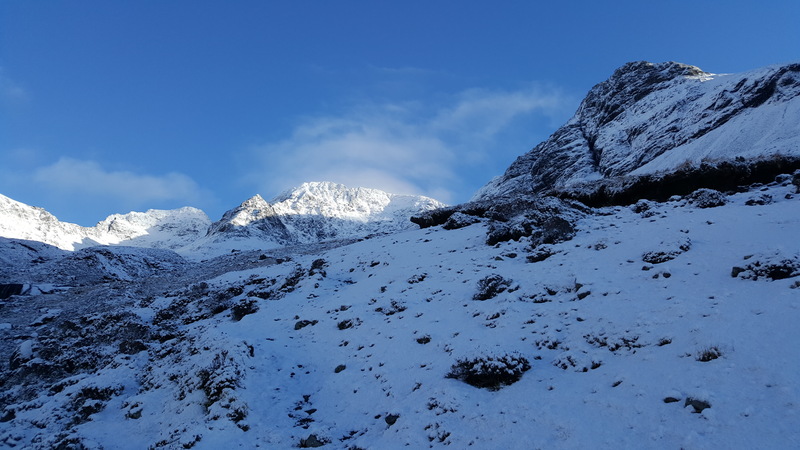 With the thaw setting in we intended to lower the bar for Wednesday’s ambitions; it seemed likely that the In Pinn would be stripped bare and make a suitable outing for what seemed likely to be the last day of winter climbing. 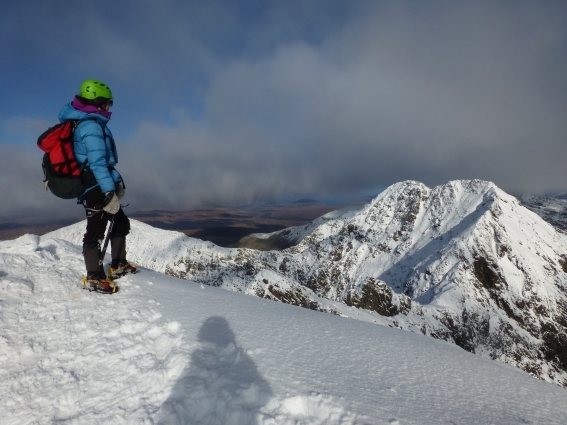 It was very obvious we were wrong about the thaw from quite an early stage but this was embraced with glee by the others; I’ve been pretty scared on the Pinn in full winter garb so was reserving judgement. 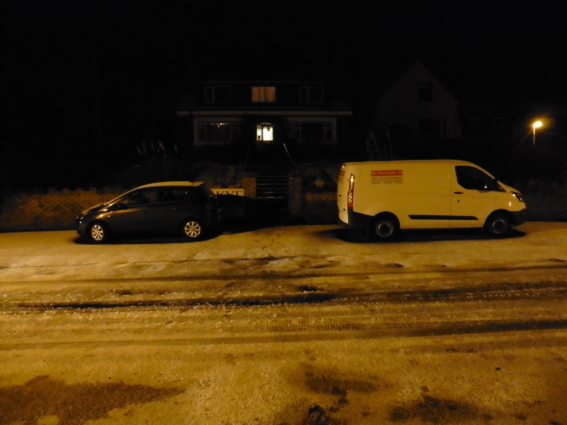 Core Lagan in full thaw! 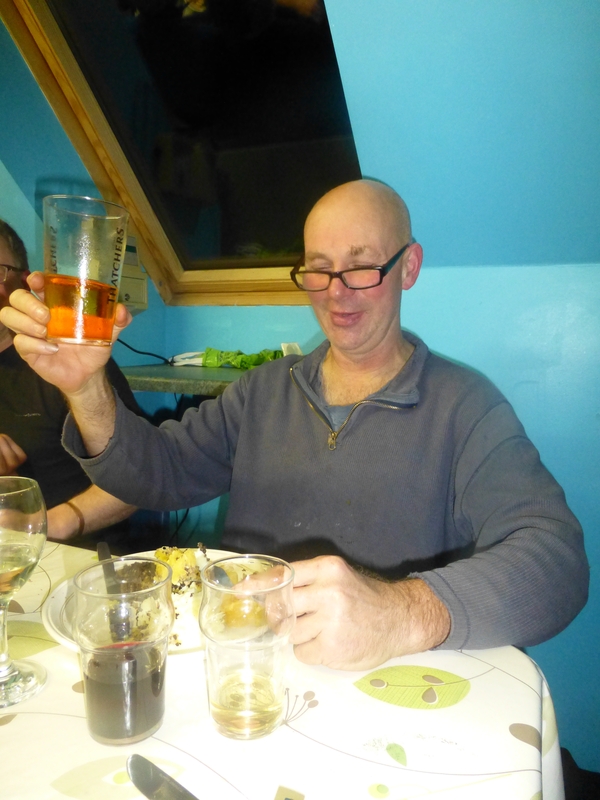 The annual dinner was a highlight as ever. 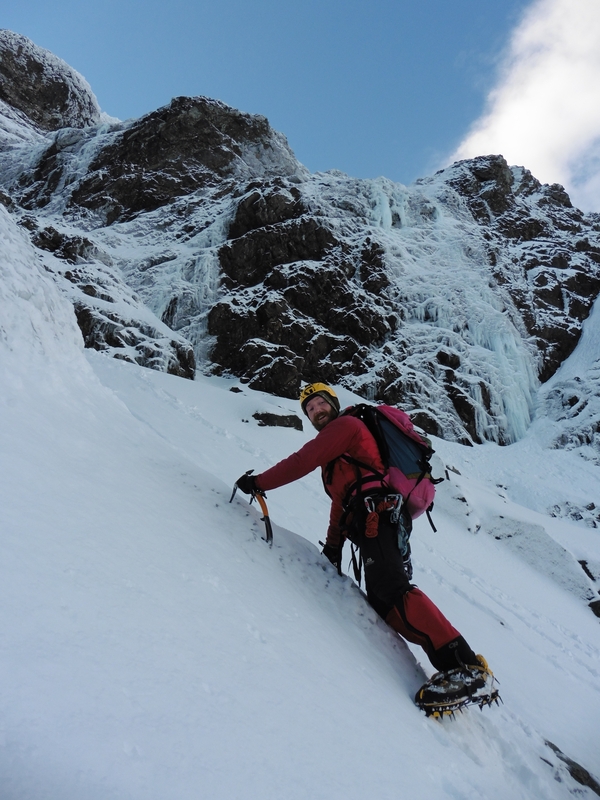 Iain addressed the Haggis in stunning style that matched his dry-tooling earlier in the day; in fact that’s how he learnt to cut the haggis with the ice axe so accurately. 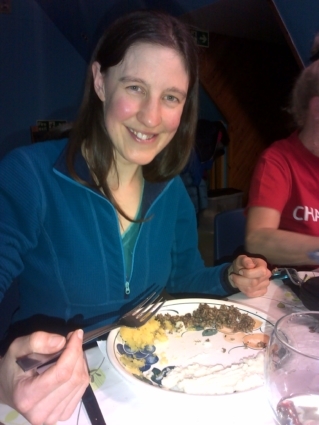 Beads gave the after dinner speech, the before dinner speech and the during dinner speech. 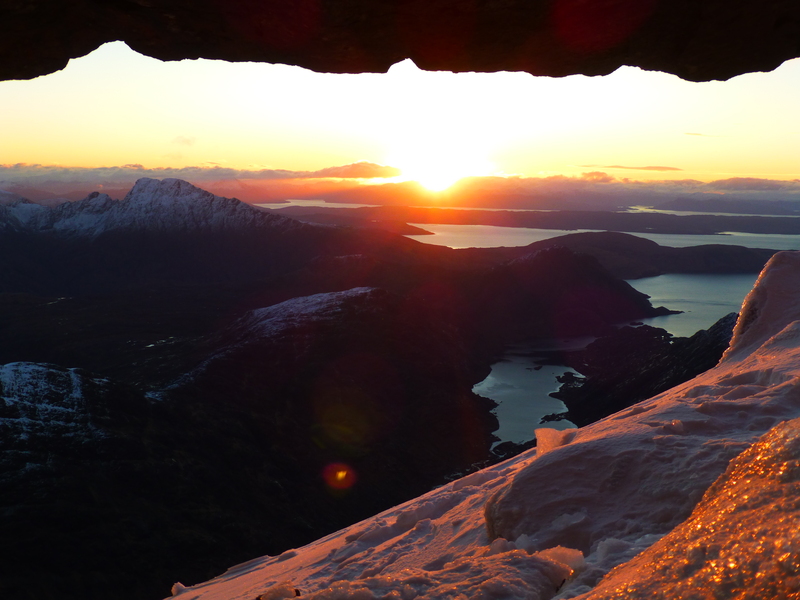 Slainte Mha! 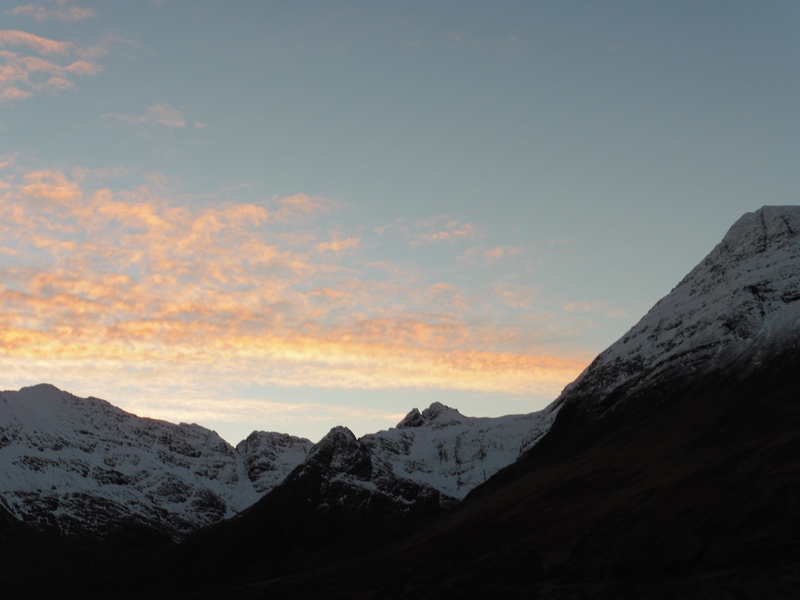 Click on the images below, once for the thumb-nail and again to view full size. The Bogeyman VI,7 First ascent 17th.